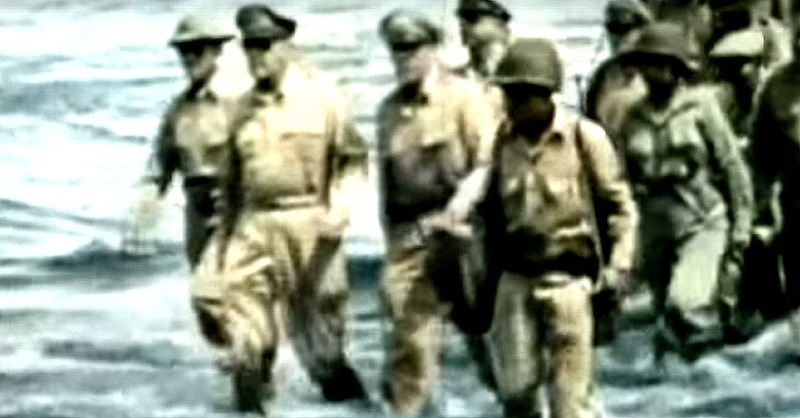 Gen. Douglas MacArthur arriving at the beachhead in Leyte in October 1944. To quickly put the title into context, I should add the phrase “at the time that he did.” And if History had panned out differently, then we would not have had the iconic images of MacArthur alighting from that lone landing craft on a beach in Leyte to wade into knee deep waters as he tried to get to shore. In so doing, General Douglas MacArthur, Supreme Commander of the Allied Forces in the Southwest Pacific Area (SWPA) in World War II, fulfilled a promise he had made to the Filipino people almost three years earlier. I was born fourteen years after the Second World War ended. But the parents of my generation, all survivors of the war, ensured that we learned at an early age about MacArthur’s promise and, more importantly, that he came back to fulfil it. In Australia, MacArthur as Supreme Commander of the SWPA was given the task of planning and coordinating all the efforts of the Allied forces in the area so that Japanese aggression in East Asia could be checked and subsequently repulsed. In 1943, however, plans being hatched by the United States Joint Chiefs of Staff in Washington D.C. did not at the time necessarily have relief of the Philippines as its primary objective, contrary to MacArthur’s statement made before he left for Australia. Everyone knows in hindsight that two atomic bombs dropped on the cities of Hiroshima and Nagasaki in 1945 forced the Japanese into surrender without the need for an Allied invasion. However, in 1943, the thinking by the Joint Chiefs of Staff was that an invasion of the Japanese archipelago was necessary to put an end to war in the Pacific. Any such invasion, or so the thinking went, had to be preceded by massive aerial bombardment. Thus, initial planning at the Office of the Joint Chiefs of Staff pointed out the need to build and secure bases in the southern or central Philippines so that Allied forces could neutralise Japanese air power in Luzon. In keeping with the 1943 plan, Allied forces moved to reclaim Japanese held areas via a two-pronged assault. Forces under MacArthur moved north into New Guinea from Australia. At the same time, forces under the command of Admiral Chester Nimitz of the United States Navy moved westward from the Central Pacific. Although the Philippine Islands were a colony of the United States prior to the Japanese occupation, its liberation was not the foremost objective of the campaign, at least as far as the planners in Washington D.C. were concerned. The defeat of Japan was. To do so, Allied forces needed to take control of a strategic triangle formed by the island of Luzon, the southern coast of China and the island of Formosa, presently known as Taiwan. How to take this triangle involved protracted debates among military planners at the Office of the Joint Chiefs of Staff. The planners were trying to arrive at a consensus as to whether Luzon or Formosa was the more important strategic objective. Seizing Formosa offered so many advantages, foremost of which was the severance of Japan’s lines of communications to the south. Also, because Formosa was closer to Japan, American bombers could carry heavier payloads than if they were to take off from bases in Luzon. In fact, because of these advantages, there was a time when many of these military planners in Washington D.C. favoured bypassing not just Luzon but the entire Philippines and pouring SWPA resources into the seizure of Formosa instead. His sentiments were echoed by many commanders out in the theatre of war, in contrast to the opinions of the military planners in Washington D.C.
A change in MacArthur’s plans ultimately convinced the Joint Chiefs of Staff not to bypass Luzon. The original plans had Allied Forces landing in Mindanao by September 1944 with the landing at Leyte planned in December of the same year. MacArthur cancelled the landing in Mindanao in favour of a direct hop by Allied Forces from New Guinea to Leyte in October of 1944. MacArthur reassured the Joint Chiefs of Staff that from Leyte, he could seize Luzon two months ahead of schedule. What this meant that there would still be time left to launch an assault on Formosa as originally provided for by plans made in Washington D.C., if at all Formosa remained a viable target after the seizure of Luzon. As things turned out, Okinawa would even replace Formosa as the preferred launching point for an invasion of the Japanese archipelago, something that would subsequently become mooted by the dropping of atomic bombs at Hiroshima and Nagasaki. How MacArthur must have ached to deliver that speech! And especially so after the circumstances of his departure from Corregidor nearly three years earlier. But that very speech through which he informed the Filipino people that he had fulfilled his promise could easily not have happened at all, or at least delayed until after the war in the Pacific had ended.